January | 2014 | Yet another blog !!!! 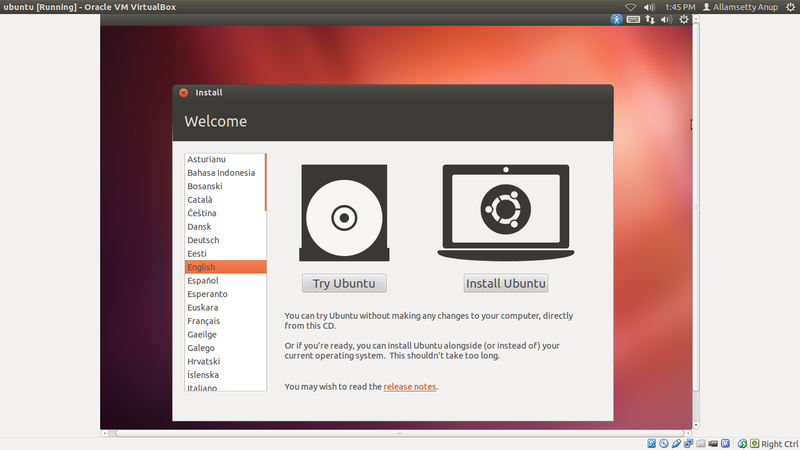 Hi, today I am going to explain how to install any Linux Distro on your PC. Basically people think installing Linux along with Windows is a big problem and causes problems to Windows. If you are installing Linux on your desktop it will run perfectly with no problems. You will get the grub screen and everything works perfect. When it comes to the laptops there will be some problems because of the UEFI problems. The biggest problem is that if you try to install Linux on your laptop, the UEFI will detect the Linux which you are going to install as a virus and it will not allow the installation process. Even if the installation is done also the grub won’t appear properly. Before installation of Linux on your system you have to change the BIOS settings of the laptop for a proper installation of Linux. For that after pressing the power button press ESC repeatedly. This will stop the normal boot of the system. Now go to the boot manager. In the boot manager go to the BIOS SETUP settings. In that go to the boot options and enable the legacy support. After changing that press F10 to save the changes and exit. Now you are ready to install Linux without any problem. Now insert the CD or the bootable pen-drive in your system and then press F9 after you press the power button. This will let you go to the boot manager. In that select the CD-ROM or the USB according to whatever source you are using. After selecting the source in the boot manager you will be booted in and will be asked whether you want to TRY or INSTALL. Choose whatever you like. Now the installation process starts. After you start the installation process you will be asked to select the language which you want and click NEXT. In the next screen you will be asked whether you want to connect to Internet or not. If you choose to connect to the Internet it will download the latest packages while the installing process is going on. If the net connection which you are using is slow then it is preferred not to check the Installation of the third-party softwares. Then click on NEXT to proceed to the next screen. In the next screen you will be asked to choose what type of partition do you want to do. The options will be different if you are installing Linux on the entire hard disk. Otherwise it will show that “Multiple Operating systems detected. What do you want to do?” In this case select Something else (the last option). Once you select the last option and click on the NEXT button you will be taken to a place where you can see what all partitions are there on your hard disk. Select the free space which you have created earlier for installing Linux and double-click on that. Now you can see a small window popping out where you can create the required partitions for installing Linux. One more thing is that it is advised to create a separate root partition in which the Linux is going to be installed. Here we need to take care of four things because you are installing along side with Windows. Creating a swap partition of memory approximately equal to twice the size of your RAM. Create an grub partition (Reserved BIOS Boot Area) of 20MB size in which the grub is going to be installed. Create a root partition (“/”) of size approximately around 20GB because the installation itself takes around 6GB of memory. Create a home partition (“/ home”) for the remaining empty space which is left over. 1) Swap Partition: Swap memory acts like a Virtual RAM for the Linux Operating System. Whenever you do some huge installations in Linux like building source codes and all it will consume the entire RAM during the installation of any source code. So what does this Swap does is that it acts like a TEMPORARY-RAM and makes the main RAM free to some extent. So the system may not get hanged in the middle of the installation. 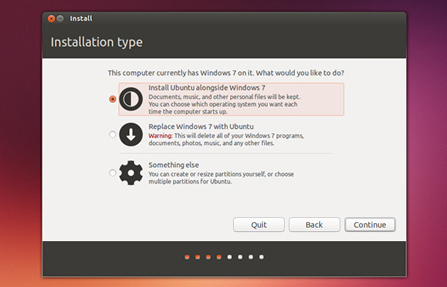 2) Grub Partition: If you are installing Linux alone this partition is not necessary. But in the other case where you will install Linux alongside with Windows you are supposed to make this partition for the grub to get installed. 3) Root Partition: It is advised to create a root partition separately because it won’t be needed to save all the data in another place and then do a fresh install. If you create a root partition separately you can just install the Linux Distro which you want only in the root partition only. The remaining data which you saved in the home partition will be the same after you do another install also. Now, after you have created the required partitions click on NEXT. In the next screen you will be asked to enter the user-name and password. Fill all the data to start the installation process. It will take a maximum of 10 min to complete the installation process. Now it will ask for a reboot. Give a reboot to the system. After rebooting also you won’t get a grub screen sometimes. In that case you pause the normal startup and go to the boot manager. There you can see the Linux Grub. If you don’t see the grub there in the boot manager then go select the Notebook Hard drive in the options. This will take you to the grub menu of the two operating systems where you can select which Operating System do you want. After logging into Linux open a terminal and enter the following commands as a root user to install all the latest updates available. This process will take some time because it needs to make the system up to date. To get the grub screen you need to do a boot repair. 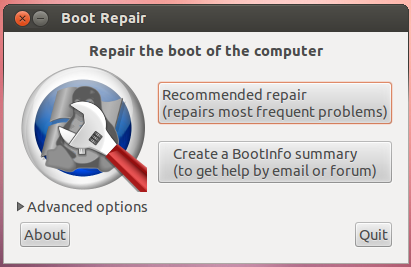 Note: If at all you are going to do the boot repair on Linux Mint, it will not work properly sometimes. The reason behind this is that the boot repair repository which you are going to add is developed only for Ubuntu systems. Since Linux Mint is a derivative of Ubuntu we can’t say that it will work properly. Boot Repair: The boot repair is used to reinstall the grub once again manually after installing Linux. To install the boot repair you need to add the following repository and install. All this process is to be done after connecting to the Internet only. For that open a terminal as root and enter the following command. Once you are done with installing the boot repair, it will open automatically. Now you will see a screen something like this after boot repair opens. Just click YES and in the next screen you will see a small dialogue box saying “UEFI Detected on your system. Do you want to continue or not?“ Just click YES and after some time you will be asked to run some commands in the terminal. Copy the commands given there and install paste in the terminal and install them. After the installation is complete you go and press the OK button. After some time it will ask you to run some more commands in the terminal. Install them also and then press OK. Wait for sometime to complete the installation of the grub. Now you will get a window opened and in that you will be given a paste-bin link, save that link and do a reboot. Now after the reboot you will get the grub installed and you can choose the OS of your choice. This is the process what you have to follow if you want to install Linux on a system which has a graphic card. If your system has a AMD graphic driver you can follow my blog post on how to install the graphic driver.